The tree is fast growing to a height of 5-15 meters, stem diameters 40-50 cm; ramified and brown. Leaf is a single leaf, sequential, heart-shaped, wide circle / oval, not curvy with a diameter of less than 19 cm. Fingers-shaped leaves, some of the main bone with gland shaped gap in the bottom side and the base side. The bottom side of leaves tighly grey haired. The fulcrum leaves elongated ovoid, length 2.5 cm, leaving a ring-shaped marks. 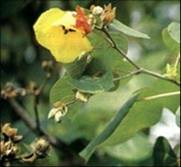 Waru flower is a single flower, bulges 8-11. The length of the petals 2.5 cm uniform, indented 5. The petals fan-shaped, length 5-7 cm, yellow with a purple stain on the base, orange in the inside and finally change to be reddish. Overall stamen tube occupied by yellow anthers. Ovary has 5 spaces, each house is divided in two by a pseudo bulkhead, with many ovules. Fruit egg-shaped short-beaked, length 3 cm, 5 spaces not perfect, open with 5 valve (Syamsuhidayat and Hutapea, 1991). Waru is widely available in Indonesia, in beach which not swampy, on flat ground, and in the mountains to a height 1700 meter above sea level. Many planted on roadside and in the corner of the yard as a sign of the boundary fence. In good soil, straight stem plants and small leaves. In less fertile soil, its trunk bent and wider leaves (Syamsuhidayat and Hutapea, 1991). In traditional medicine, hibiscus root is used as a coolant for fever, hibiscus leaves help hair growth, as cough medicine, medicine for bloody / mucoid diarrhea, tonsil. Flowers used to cure trachoma and colds (Martodisiswojo and Rajakwangun, 1995). Chemical content of leaves and roots of hibiscus are saponin and flavonoids. Besides that, hibiscus leaves also contain at least five phenolic compounds, whereas the roots of hibiscus contain tannins (Syamsuhidayat and Hutapea, 1991). Chen et al. (2006) isolated several compounds from the bark of the hibiscus, such as : new scopoletin (hibiscusin), new amide (hibiscusamide), with 11 compounds has been known that are acids fanilat, P-hydroxybenzoic acid, syringic acid, P-hidroxybenzaldehyde, scopoletin, N-trans-feruloytyramine, N-cis-feruloytyramine, mixture of beta-sitosterol and stigmasterol, mixture of sitostenone and stigmasta-4,22-dien-3-one. From the cytotoxic test these compounds, There are three compounds that have excellent anticancer activity against cells P-388 and or cells HT-29 in in vitro with IC 50 value < 4 < µg/ml.